Technically in Jefferson County, this cemetery is separated from the rest of Jefferson and its physical location is closer to western Clallam County. 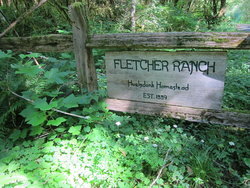 Clallam County Genealogy Society has a list of ten burials in Lower Hoh Cemetery (Fletcher) and 11 burials in the Upper Hoh Cemetery (Huelsdonk). John Huelsdonk and his wife, Dora (Wolff) Huelsdonk, were the first settlers on the Hoh River and the Olympic Peninsula's most famous pioneers. Huelsdonk's homestead, claimed in 1891, was on the west side of the Olympic Mountains in Jefferson County, approximately 30 miles up the Hoh Valley. It is the wettest area in the continental United States, receiving more than 12 feet of rain a year.